Longridge Olives Extra Virgin Olive Oil is made from perfect olives, that are carefully harvested and gently squeezed within 24 hours to create the most deliciously, healthy and tasty product that has a multitude of use. Our Extra Virgin Olive Oil is a 100% authentic Australian product that complies with AS 5264-2011 (Australian Standard for Olive Oils and Olive Pomace Oils) and with the Australian Olive Association’s, Code of Practice. For an oil to be classified as Extra Virgin in needs to have a FFA (free fatty acid) level less than 0.8%, a PV (peroxide value) of less than 20 and be organoleptically (taste) free of defects. Longridge EVOO has a FFALongridge Extra Virgin Olive Oil easily meets these standards. Australian Extra Virgin Olive Oil is the most beneficial oil for your health. When eaten as part of a healthy diet, it can help prevent cardiovascular disease, cancer, ageing and diabetes. It’s good for your hair, your skin, and your immune system, and what’s more it can act as a natural anti-ageing product, boosting the body’s anti-inflammatory mechanisms. the region in which it’s grown. If the olive oil gets from the tree to your table quickly, it’s healthiest and freshest. And FRESHER TASTES BETTER! the risk of heart and cardiovascular disease by lowering the levels of artery-clogging lipids in the blood. A diet rich in fresh, good quality extra virgin olive oil can make your skin glow and hair shine. 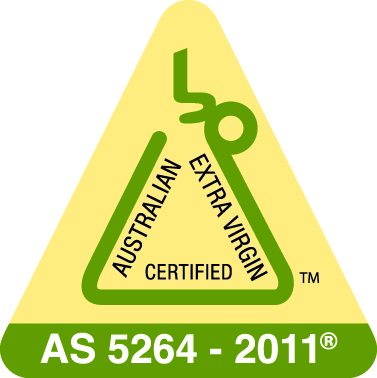 Our Longridge Olives Extra Virgin Olive Oil complies with Australian Standards (AS 5264-2011) and the Olive Industry’s Code of Practice. This symbol is your guarantee of authenticity and quality and distinguishes excellent oils from other products. To maintain a high standard of quality, certification is the required step and to be certified, products must have undergone organoleptic and laboratory testing, and be Australian.